We have reached the halfway point in our nonfiction text features study. It was time to slow down and see if students could identify the features within a piece of nonfiction text. 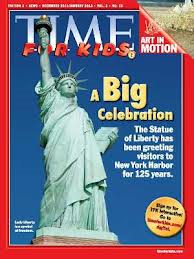 I have a subscription to Time for Kids (TFK) magazines for 2nd grade students this year. A collection started piling up in October and November. I wanted to save some of the magazines for our nonfiction study. I’m so glad I did! After 15 minutes of “hunting”, we gathered back together to share. Using just those two magazines, the kids were able to find everything on our list except for a timeline. Trust me, a few tried to get creative and show me how many dates and years they could find so it was a good time to review what a timeline meant and show examples…again! I think this will still be a fresh and new activity once we add more nonfiction text features to our study. If you have other ways to informally check to see if students can identify nonfiction text features I’d love to hear about them. We discussed nonfiction text features last week. This will be a great refresher and small group activity!